Michigan Fishing Reports for Muskegon, Pere Marquette, and Manistee Rivers. Please Check out our Michigan fishing reports for local rivers. King Salmon: Starting to see a good number of King Salmon on the Little Manistee River. Lower Pere Marquette River has a few also. Salmon Season is just around the corner. PM & Manistee River trips available. Smallmouth Bass: Smallmouth Bass fishing has been EXCELLENT. Good numbers throughout the river system. Morning and mid day fishing very well. Also seeing a few walleye each trip. Soft plastics fishing well. Trout fishing remains strong in the upper river below Croton Dam. Caddis emergence each evening. Salmon, Steelhead and Sucker fry also fishing well for trout. Beat the Heat! Hot Weather makes for great Smallmouth fishing. Great Kid’s trips! Salmon parr, Steelhead fry, and Sucker fry are making up the bulk of the trout diet right now. Millions of minnows along the shore line. Fish key on fry this time of year. Fry is the name of the game right now! Salmon parr, Steelhead fry, and Sucker fry are all along the shore line at this point. Any shade pocket against the shore line is loaded with minnows or fry. Chinook Salmon parr, Steelhead fry, and Sucker fry are making up the bulk of the trout diet right now. Both Smallmouth Bass and Muskegon River Trout are gorging on fry at this time. Sink tip fly lines with fry patterns are working well. Big numbers of trout in the upper river below Croton Dam. Smallmouth Bass are through out the main river. Crank baits and spinners are also working well. 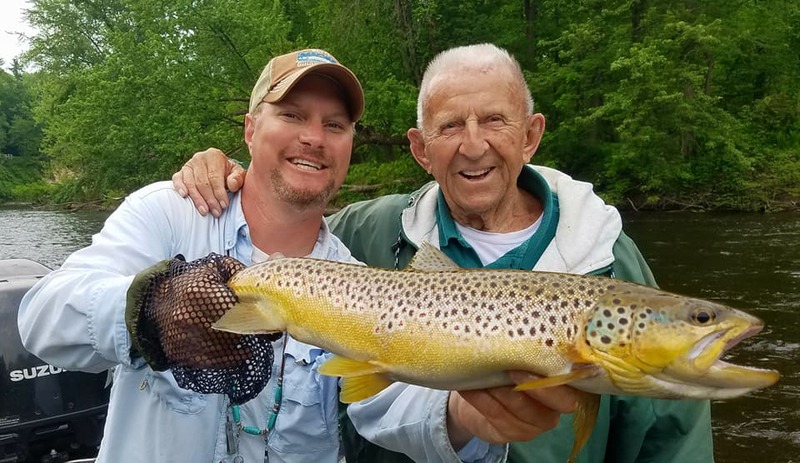 Ed, 90 years young, displays a gorgeous Michigan Brown Trout caught on a sucker spawn imitation. John with a huge Muskegon River Brown Trout. Much larger fish this season! Great Michigan Trout Fishing. Michigan Trout fishing has been phenomenal on the Muskegon River. Hot and humid weather has the bugs popping big time! Caddis and caddis emergers are now taking center stage. Most activity occurs in the evenings, after 7pm. Gray Drake spinner falls are still available, offering some trophy fish taking dries. Sucker spawn by day – Hatches during the evening. What a time to be on the water! Red Horse Sucker Spawn provides a great meal for larger Muskegon River Trout. Trout gorge on sucker spawn in Michigan Rivers. During the Michigan Sucker Spawn many nymphs, larvae, steelhead fry, Salmon fry, and sucker eggs are dislodged – Trout feed heavily on these food sources. Our main focus now is Michigan Trout fishing. The river is at a nice level and clear with water temps in the 50s. Large numbers of salmon, steelhead, and sucker fry are present against the shoreline. Sulphurs, Gray Drake, and Caddis are the prime hatches now. Red Horse Suckers are also starting to load up which should make for outstanding trout fishing. Muskegon River Trout feed heavily on the eggs of the spawning Red Horse Suckers. The native fish provide a staple food source for our resident Brown and Rainbow trout. Trout on the Muskegon River have been feeding heavily on the numerous insect hatches going on right now. The most prolific are the cinnamon sedge Caddis and the Gray Drake. These hatches take place in the afternoon and evenings. The Gray Drake spinner fall takes place right at dusk. These hatches offer some of the best trout fishing in Michigan. Gray Drake spinner fall at dusk. Sturgeon sightings are beginning to become common on the Muskegon River. These gentle giants glide next to the boat while trout fishing. Exciting to see! Over the past several days, Muskegon River Trout fishing has been going great! We’ve been finding larger, hold over trout daily. At least one 20″ plus trout on just about each guided trip. Seems to be good numbers feeding on the sucker spawn. This trend should continue for the next 10 days or so. Trout on the Muskegon River have been feeding heavily on the numerous insect hatches going on right now. The most prolific are the Cinnamon Sedge Caddis and the Gray Drake spinner fall. These hatches take place in the afternoon and evenings. Hopefully the first of many. Mike with a beast of a brown trout. Streamer fishing has been hot! Michigan Trout Fishing – Ashallie displays a gorgeous Brown trout while nymphing with sucker spawn. Fishing Notes for Today: Heavy Gray Drake Spinner Fall this Morning around Pine St. Size #10 – Gray Drake Spinner dry fly or rusty dun dry flies. Trout fishing in Michigan is in full swing! With a cooler than normal spring, the Muskegon River Trout Fishing is just starting. There continues to be small pockets of Steelhead available through May. Water temperatures are starting to climb into the low 50’s. Dry Fly hatches such as adult Stone flies, Gray Drake, and Sulphers will begin to play a key role in the trout’s diet. May and June offer high growth rates for trout, and a smorgasbord of feeding options. Michigan Trout fishing is certainly best during May and June. Water is clear. Wading is available. Trout fishing is excellent. Coming soon, Muskegon River Sucker Spawn “Hatch”. Less than one week away! Thousands of Red Horse Suckers ascent into the upper sections of the Muskegon River. Large Brown Trout follow these suckers and when the sucker spawn begins, trophy Brown Trout gorge on sucker eggs. Trout also key on nymphs dislodged by suckers actively spawning. The Muskegon River Sucker Spawn offers clients a chance at true trophy Brown Trout (over 25″) Big Brown Trout feed recklessly during the sucker spawn, and can be sight fished while fly fishing. Casting to specific trophy trout can certainly be exhilarating! Chinook Salmon & Steelhead Fry also play a huge part in the trout’s diet this time of year. Trout take advantage of the millions of fry along the shoreline of the Muskegon River. Any shade pockets along the river are loaded with salmon and steelhead fry making for easy prey for larger trout. Mallard flank fry patterns stripped along soft water near shore offer consistent trout fishing. Fly Fishing with light sink tip fly lines, (Rio DC 150 gr) against the bank works well. Usually the softer pockets hold fish. Michigan Dry Fly Fishing – As the water temperatures finally warm into the mid 50’s, dry fly hatches are key. Right now, adult stone flies can be seen during the afternoon. Trout feeding on stone flies are easy to see. Big, splashy rises are common for trout feeding on stone flies. Gray Drakes, Sulphers, and Isonychia should begin to pick up in late May, and early June. The Muskegon River boasts the largest Gray Drake spinner fall in the Mid West! Huge clouds of drake spinner fall at dusk. Fat and sassy Rainbow Trout are common on the Muskegon River. Trout fishing is excellent during May & June. We offer three guided fishing trips for Muskegon River and Manistee River Trout Fishing. Full Day Guided Fly Fishing Adventures. Instructional Casting, Dry Fly Fishing, Nymphing with shots at larger fish during the Sucker Spawn, or on dry flies. Streamer fishing can also be excellent. ($350 – 2pm – dark) All gear, tackle, and flies provided at no extra charge.